Julia is two movies, masquerading as one. No, it’s not an anthology film, in the vein of Grindhouse, with two completely distinct films shoved together to hit some artificially imposed amount of content/running time. Nor is it an explicitly episodic film, capturing a series of events in the life of the same characters. Rather, it’s a film of two distinct halves, telling different stories, about the same basic characters. Which makes it sound episodic, though it’s not. Call it an ‘Athosodic’ film. Or an ‘Epithology’. Either one is fine. The first is the mundane story of writer Lillian Hellman (Fonda), a needy, annoying nag. Except, calling her a writer isn’t really fair because, in this story she’s not yet written anything, but is only just working on a play at the coastal beach house she shares with actual-writer, Dashiell Hammett (Robards). Even if Hammett doesn’t seem to be writing at all. Amongst it, she’s haunted by the memory of her childhood friend, the titular Julia, who she hasn’t seen in many years. Though Julia was raised by her extremely wealthy grandparents, she’s very much a politically-woke woman, and long ago disappeared into pre-WWII Europe, where she’s part of the Nazi resistance. The second movie has Hellman enjoying the success of her plays and travelling off to some conference in Russia. En route, Julia’s people contact Hellman to have her smuggled $50k in cash into Germany, so as to fund an anti-Nazi cause, or buy the release of some prisoners, or something like that. And there in Berlin, for just a moment, the two old friends meet again. There is much to love in Julia. I particularly enjoy the way the movie is told, in an almost impressionistic way, flitting thematically through time to see younger versions of Julia and Hellman, with the soundtrack, incidental sound and dialog from one period left to overlap another. In this was way, the story is told with emotional-linearity, rather than objective-linearity, which still left the movie feeling completely cohesive, if only in a different way than we’re used to. In a way, much of the movie is built on emotions, rather than any sort of plot. That said, while there’s much to love in Julia, there’s as much, if not more, to dislike. First, while the emotional core of the movie feels spot on, it’s working hard as hell to hold together a narrative that is muddled and poorly shaped. 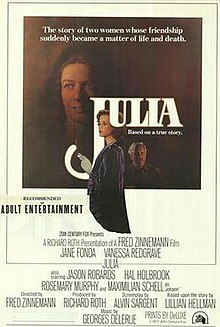 Here’s the major problem with Julia: much of it feels unnecessary, particularly the sequence of Hellman trying to write her play, which ultimately has little bearing on any other part of the movie, or adds anything to it, and could be dropped without losing a beat. In a way, the writing of the play feels like an intruder from another movie, given the only character of consequence who overlaps one story to the other is Hellman herself. If the narrative wobbliness were all there was to complain over, Julia could still be great – uneven, but great. Unfortunately, the uneven acting only compounds the problem. Sure, Robards and Redgrave are natural and fine, and seem to be putting forth little effort in their performances, but they are in far-too-little of the film, and have far-too-little to do when they are. On the other hand is Fonda, who is in virtually every frame of the film, and is decidedly awful. It doesn’t matter she was nominated for an Oscar for the role, because if there’s anything The Best Picture Project taught us, it’s that the Oscars are no guarantee of quality. The problem is, in a movie where everybody else seems to live in their roles, Fonda is the one most obviously acting her’s. Everything she does feels mannered and false and she only finally seems to come in line with the film’s vibe during the smuggling of the money sequence, when her dialog melts away and she only has to ‘do,’ not ‘act’. That she’s best when she says nothing, and only has to hit her marks, says everything. Julia is the rare movie about a writer that actually shows the writer writing in a legitimate way. Normally, you wouldn’t see that kind of thing, because writing is a singular, solitary endeavor and offers nothing obviously ‘cinematic’. After all, there’s only so much you can do with a guy sitting at a typewriter before boredom kills you. Aside from Adaptation, Julia might present the most realistic take on what it is to be writer. And even then, neither does a good job of it, which sort of says everything. In a word, no. 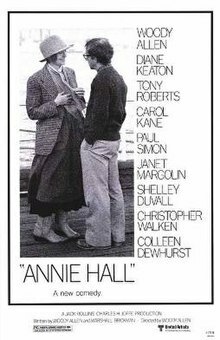 After all, 1977 was not only the year of Annie Hall, which won Best Picture, it was also the year of Star Wars. Under those circumstances, there is no argument to be made it was an unfair loser of Best Picture and should not have been an Also-Ran. Moreover, Julia is not even amongst director Fred Zinnemann’s five best films, easily topped by The Day of the Jackal, High Noon, From Here to Eternity, Oklahoma! and A Man For All Seasons. Again, it was an Also-Ran for a reason. Best Supporting Actor, or Best Supporting Actor? Jason Robards won back-to-back Best Supporting Actor Oscars for 1976’s All The President’s Men, and 1977’s Julia. Winning back-to-back Oscars in the same category is rare and has happened maybe a dozen or so times. The most recent back-to-back winners were Alejandro Gonzalez-Inaritu, for directing Birdman and The Revenant, and cinematographer Emmanuel Lubezki, who pulled in the ultra-rare threepeat, winning for Gravity, Birdman and The Revenant. Despite having won an Oscar for it, it took a while for me to warm to Robards’ performance in All The President’s Men – it never seemed the kind of performance that should win an Oscar. It wasn’t showy, did not involve any sort of breakdown or illness or eccentricity; in other words, it did nothing you’d expect of those sorts of roles. Rather, he was a solid part of an ensemble, doing his job in an unfussy way. It was only later I made peace with the win, realizing it was Robards’ easy steadiness holding the film together. In this way, I came to terms with the fact that when we look at Best Supporting Actor or Actress, we should look less at the ‘Actor’ or ‘Actress’, and more at the ‘Supporting’. What makes Robards Oscar-worthy is that, rather than come into the movie and demand all attention be placed on him, he merely shows up, offers support to the leads, and gets the hell out. Usually, that role is overlooked – see, for example, Live Schreiber in Spotlight – but occasionally it wins. Even more-occasionally, it wins twice in a row. Meryl Streep made her screen debut in Julia, playing a small part as an exceptionally-pale brunette who meets Hellman late in the film. Also exceptional? It’s one of the few roles she performed where she neither used an accent, nor got an Oscar nom. Honestly, it doesn’t really matter what the money is for, because the movie barely touches on that at all, only enough to see the money is needed. The important thing is smuggling the money into Germany is dangerous for Hellman, given she’s Jewish. Others Oscar threepeaters were costume designer Edith Head, sound mixer Thomas Moulton, visual effects artists Jim Rygiel and Randall William Cook, and composer Roger Edens. The only one to beat them all was Walt Disney, who won Oscars in eight consecutive years during the 1930s, though he did so across a few different categories. His personal record in the same category was four in a row. Even if I personally find Robards part a bit blah and unnecessary to Julia.